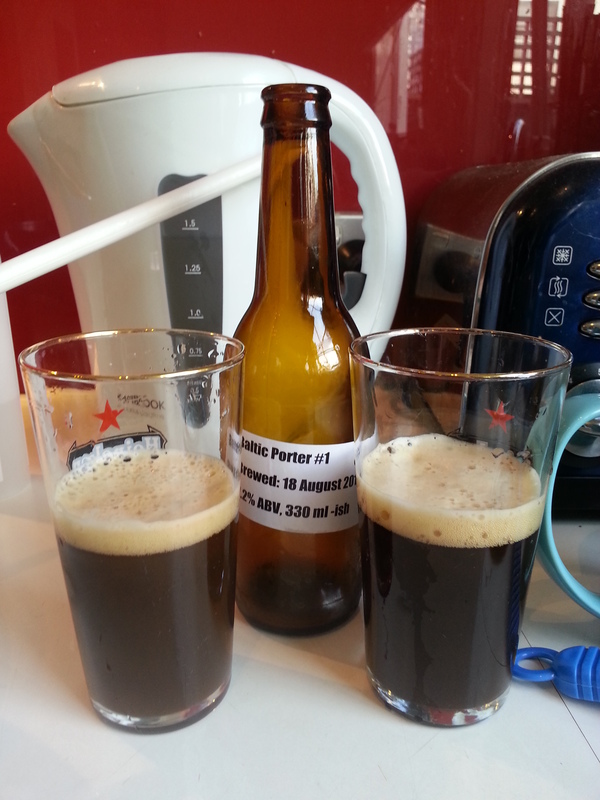 Mikey made his Baltic Porter while I was away, and luckily enough, it was ready for drinking as soon as I came back! It definitely looked like a porter! Nice and dark, good head. That’s where the porteryness ended though – although it still turned out to be a great beer! On the nose, there was a ton of apple and a bit of honey along with a bit of malt. I’m not sure where the apples were coming from, but the honey was probably coming from the added Crystal grains. This continued through with the taste, along with the apple. This was right up front and very refreshing. With that, there was a good amount of body, just not as much as I usually like to see in a porter. So while it looked like a porter, this beer was very quickly moving away from what I’d consider a porter. I’d classify this closer to a dark ale. The good news is I love dark ales, and this was a good one, so I’m not complaining. On the porter side though, there was a hint of the typical porter tang/bitterness at the very end, along with a very minor hint of smokiness, but the beer was so light it was still hard to call a porter. It was a bit creamy like a porter, just not robust like a porter. The surprising part about this beer is that it was 7.2% alcohol, which you’d never know by drinking it – until you’ve had a couple that is… it’s a pretty smooth beer with only the slightest hint of dryness from the alcohol. Overall, great beer, regardless of what you call it. I’d gladly drink more. Mikey wants to add some chocolate, which I’d welcome.